Get Vendio Gallery - Now FREE! 15 STRATTEC OEM VATS KEYS. Strattec #595511 - OE# 2601939 2 - B62-P1. Strattec #595512 - OE# 26019393 - B62-P2. Strattec # 595513 - OE# 26019394 - B62-P3. Strattec # 595514 - OE# 26019395 - B62-P4. Strattec # 595515 - OE# 26019396 - B62-P5. Strattec # 595516 - OE# 26019397 - B62-P6. Strattec # 595517 - OE# 2601939 8 - B62-P7. Strattec # 595518 - OE# 26019399 - B62-P8. Strattec # 595519 - OE# 26019400 - B62-P9. Strattec # 595520 - OE# 26019401 - B62-P10. Strattec # 595521 - OE# 26019402 - B62-P11. Strattec # 595522 - OE# 26019403 - B62-P12. Strattec # 595523 - OE# 26019404 - B62-P13. Strattec # 595524 - OE# 26019405 - B62-P14. Strattec # 595525 - OE# 26019406 - B62-P15. SINGLE SIDED OEM VATS IGNITION KEY BLANKS. OHMS: 0.403 K TO 11.800K. BUICK CADILLAC CHEVROLET OLDSMOBILE PONTIAC. EACH CAR CAN HAVE 15 DIFFERENT KEY VALUES (VATS). WRONG KEY VALUE WILL NOT START THE CAR. THIS IS NEW BLANKS KEY (UNCUT). Not sure which value you need? If you have a meter with an Ohms setting, set it on 2OK and place one lead on one side of the pellet and one lead on the other. A value will be shown. Use the chart below to determine which number you need. If your Ohms value does not match the charts number exactly, round it to the nearest number. Example: Your key measures 1.18O Ohms. Need is the number 5 key as it is closer to 1.13O Ohms, than O. 887 (4) or 1.47O (6) Ohms. This system seems to cause much confusion, stress, and misery. Hopefully, this will help elevate. VATS stands for Vehicle Anti-Theft System. It is commonly referred to as PassKey. Later versions include PassKeyII, PassKeyIII and PassLock (which uses no resistor "pellet"). First introduced VATS in 1985 on the Chevrolet Corvette, and after proving successful, was later. Introduced in other models in later years. Lets break it down even further. Operation: Operation is fairly simple, but lets discuss what all makes up the PassKey system. The most obvious part is the key. The ignition key as a little "chip" in it. There are 15 possible resistances, therefore 15 different types of keys each with a. This reduces the likelihood of a potential thief from having the correct. Then you have to have a special lock cylinder to "read" the key. Use the term "read" loosely, because it does anything but read the key. I will explain more later. Next is the VATS module. It does most of the security work. It is the "brains" of the system. The module is what actually "reads" the resistance, but has to do it via the contacts in the lock. Cylinder and the related wiring. Think of the module as a Multimeter, and the wires and contacts. The module reads the resistance and determines if the resistance is the. The module will go into several modes, depending on what the module sees. Is "Tamper" "Normal" and "Fail Enable". Normal: Normal is when the correct resistance is seen during cranking and the module will ground. The Start enable relay, and send a "Fuel Enable" signal to the ECM. This basically "turns on" the. If the Fuel Enable signal is lost or not sent, the injectors will never pulse. Unique "Pulse Width Modulated" signal, which is a series of rapidly switched "on" and "off". Voltages that would be near impossible to duplicate. Once the relay is grounded, voltage is allowed. To the "S" terminal of the starter, and the ECM is told to pulse the injectors and the car starts. Tamper: This mode happens when the vehicle is cranked, and the resistance value as seen by the. Module is not the same as the value stored in the module. When this happens, the module shuts. Even if the correct resistance is then seen, the car will not start for the 4. The security light will also illuminate for the 4 minutes. Relay will not energize and the Fuel Enable signal will not be sent. HINT: if the key pellet is dirty. It will put the module in the "Tamper" mode. If your car fails to crank/start and the security light. Comes on, try cleaning the pellet, wait 4 minutes, and try again. Fail Enable: This mode is to help keep the motorist with the right key from being stranded. Failure happens to the PassKey system AFTER a valid start, this mode is initiated. Vehicle to be restarted, even with a failure present. The security light will remain illuminated to let. You know a failure is present. However, this also means that the car can be started w/o a key, and. Is vulnerable to potential thieves. Lets take a look at the basic setup. If your car doesn't want to crank and the security light comes on, here are a few things that may. Hopefully get you back on the road. First, make sure the pellet is clean. A dirty pellet will give a higher resistance than what the VATS. Module expects to see, and assumes it is the wrong key. Check all of your fuses. If a fuse is blown or missing, it can cause a security problem. Obtain a multimeter and measure the resistance of the key. Then remove the hush panel on the drives. Side of the dash and find the wires that go to the lock cylinder usually two thin white wires, sometimes. With orange insulation around both. Now measure the resistance at the two wires with the key in the. If it doesn't come within a few Ohms of the original key resistance, the lock cylinder is bad. If the resistance comes up OK, measure it again, this time while moving the key from "Off" to "crank". Any fluctuation in resistance means a bad lock cylinder. This is the most common cause. The wire are anchored to the stationary steering column, but attached to a rotating lock. Cylinder and over time, the wire breaks inside the insulation and usually becomes "open" in the crank. This is read by the module as an incorrect resistance. These are the basics of VATS diagnostics. If the problem is not found, it will have to be taken to a. Priority International Small Flat Rate Box is a good choice, especially when purchasing more than one item... We do not mark merchandise values below value or mark items as "gifts" - US and International government regulations prohibit such behavior. International buyers that use 1. 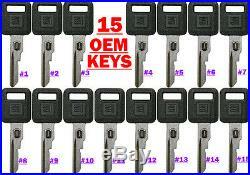 The item "15 NEW GM FACTORY ORIGINAL VATS SINGLE SIDED KEY BLANKS 26019392 Thru 26019406" is in sale since Saturday, April 5, 2014. This item is in the category "eBay Motors\Parts & Accessories\Car & Truck Parts\Ignition Systems\Key Blanks". The seller is "bbblocks" and is located in San Francisco, California. This item can be shipped worldwide.